It is my honor to welcome like-minded visitors of the Fund's website! Our All-Ukrainian Association unites experts in different spheres of the renewable and traditional energy field and in the energy conservation sphere. Independent experts of the Fund analyze legislative initiatives, conduct expert estimation of activities of state organizations in the energy efficiency sphere, and address respective institutions and organizations with offers concerning the development of this market sector. We generalize the experience of the best scholars and enterprises, disseminate it and help find investors for effective investments into the Ukrainian economy. We invite to cooperation all those who perceive the term "energy efficiency" not merely as a fashionable phrase, but as the essence of professional activity. We will achieve more together! Sincerely, Honorary President of the Association All-Ukrainian Amalgamation 'Fund of Energy-Efficient Investments', Igor Cherkashyn. "The Agreement About an associated membership"
Page of design formula "ENERGY INDEPENDENCE OF UKRAINE"
The Association was founded to popularize ideas of energy efficiency, study of experience of enterprises, authorities of the country in development and implementation of energy efficient technologies, production of energy efficient equipment and promotion of the best practice. Everyone who cares for energy efficiency is welcomed to the association – together, we will achieve more. ASSOCIATION «ALL-UKRAINIAN AMALGAMATION «FUND FOR ENERGY-EFFICIENT INVESTMENTS» is all-Ukrainian, voluntary, non-profit association of legal persons. 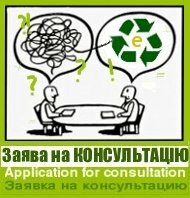 The main aim of the Association is to bring to Ukrainian community the current requirement of urgent implementation of energy efficient measures in all life spheres to reduce dependence of Ukraine on import of energy resources and to achieve maximum efficiency of fuel and energy resources and water at necessary level of development of engineering and technologies and at the same time reduce of negative anthropogenic impact on the environment. Coordination of actions of its members in investment attraction into effective use of energy resources, development of alternative energy sources and production of energy efficient equipment and materials. Promotion of social-and-economic, organizational and legal conditions for effective development and use of scientific and technical potential, implementation of modern ecological, safe, energy and resource efficient technologies, production and sale new types of competitive products. Methodical assistance to the Association’s members during elimination of defects in work or professional development of employees and members of the Association. Informational support, notably collection data about production, production capacity and other, including the purpose of marketing research, and their promotion in generalized view not before one month after collection on conditions that these data will not be used against the Association’s participants and/or rivals. Shift to biodiesel and biogas in public transport. Changing public transport which has been put out of operation to electrical and combined transport (hybrid transport). Creating of filling biofuel and electrical transport charging stations. Creating of secure and comfortable street lights with the help of LED-Technologies and modern monitoring systems. Taking part in implementation of project «Green District», where the primary kinds of transport are electrical transport and bicycles. Taking part in developing of traffic interchanges, which can help to reduce the amount of transit transport in the city. Taking part in developing of transport control systems in the city and using appropriate monitoring systems to decrease emission of exhaust fumes into atmosphere. Taking part in developing a normative base for municipalities for transport control to reduce negative influence on atmosphere of the city an optimization of traffic streams. Popularization of ««Cities for Mobility» ideas and activities to reach advanced standards of city mobility. On the 20th of March 2013 at a meeting of the Committee of Verkhovna Rada of Ukraine on Fuel and Energy Complex, Nuclear Policy and Nuclear Safety was examined a question of accreditation of consulting companies and NGOs to the Committee. Committee members decided unanimously to accredit a number of NGOs and consulting companies to the Committee of the Verkhovna Rada of Ukraine on Fuel and Energy Complex, Nuclear Policy and Nuclear Safety. All-Ukrainian amalgamation "FUND OF ENERGY-EFFICIENT INVESTMENTS" was accredited as an profile organization in energy efficiency and energy saving. The Honorary President of All-Ukrainian amalgamation "FUND OF ENERGY-EFFICIENT INVESTMENTS" Igor Cherkashin addressed to the participants of V specialized conference "AUTOMATION. FEC. 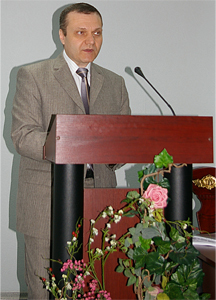 UKRAINE 2012" which took place in Kiev on December 5, 2012 with welcoming speech. 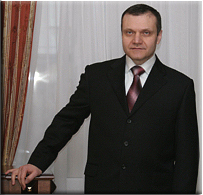 The Foundation and its honorary president Igor Cherkashyn awarded in nomination "Leader of the national economy" in the Golden Book of Ukraine "Golden Fund of the Nation 2012". On the 20th of September, 2011 the opening of the International Exhibition " UKRAINIAN Energy INDUSTRY 2011" and presentation of the project "Fuel and Energy Complex of Ukraine. Energy Efficiency in Ukraine. Flagships of the coal industry" was held at the forum FUEL AND ENERGY COMPLEX OF UKRAINE: THE PRESENT AND THE FUTURE Organizers of the project are "Ukrainian Confederation of Journalists" and JSC "National ratings of Ukraine". Igor Cherkashin, the Honorary President of the All-Ukrainian amalgamation "FUND OF ENERGY-EFFICIENT INVESTMENTS" took part in the presentation and made a welcoming speech, as well as review of the project materials. We initiate the discussion of the "The concept of bioenergy in Ukraine"
It should be noted concerning the process of expanding the application of the bioenergy in Ukraine that the bio-energetic complex of state is usually created in the structure of the agricultural ministry. Exceptions are the countries with the development of the industry formed to a separate structure. As for Ukraine, there is no clear centralization of government policy on bioenergy. WE INITIATE IN UKRAINE "THE DAY OF THE EFFICIENT USE OF ENERGY RESOURCES"!!! Honorary President of the Association All-Ukrainian Amalgamation 'Fund of Energy-Efficient Investments', Igor Cherkashyn took part in Round table “Energy efficiency in Ukraine. The state of affairs and future prospects". The event was organized by Ukrainian Confederation of journalists and press centre of Ukrinform. Honorary President of the Fund Igor Cherkashyn took part in the round table “The reform of the housing sector in Kyiv” which was organised by management of Kyiv city administration. Ministry of Fuel and Energy of Ukraine supports introduction the TOP Energy efficiency contest which is carried out by the Association «All-Ukrainian Amalgamation «Fund of Energy-Efficient Investments». It said in the letter from the Ministry, that the contest will promote companies to develop and implement energy efficient policy. The Committee on Fuel and Energy Complex, Nuclear Policy and Nuclear Safety supported initiative of Association «All-Ukrainian Amalgamation «Fund of Energy-Efficient Investments» concerning carrying out annual Ukrainian contest «TOP-Energy efficiency» in order to identify and reward leaders in the sphere of energy efficiency, popularization of the best energy saving technologies and equipment. The Committee accented that identification of achievements of the contest's dominants at the highest state level is necessary. They establish new standards and are the example in relevant sphere. October 14, 2010 Association «All-Ukrainian Amalgamation «Fund of Energy-Efficient Investments» received an official confirmation of membership in the network Cities for Mobility. The city of Stuttgart confirms the affiliation of our organization to the global network Cities for Mobility. Oсtober 1, 2010 State Department of Intellectual Property documented Certificate №35226, which confirms that Honorary President of the Fund Igor Cherkashyn and Executive director of the Fund Olena Nikitina are copyright holders for “Statuette “Lily Energy efficiency”. The Fund officially informs all those who use or who intend to use this name, that author’s consent is necessary. September 30, 2010 State Department of Intellectual Property documented Certificate №35209, which confirms that Honorary President of the Fund Igor Cherkashyn and Executive director of the Fund Olena Nikitina are copyright holders for the documents which regulate contest of the name which consists of “TOP Energy efficiency”. The Fund officially informs all those who use or who intend to use this name, that author’s consent is necessary. September 28-30, 2010 in the framework of the III International Economic Summit DID in Donetsk there took place Fair of Investment Projects, organized by common efforts of Euro Asian International Chamber of Commerce and Association “Fund for Energy Efficient Investments”. Executive director of “Fund of Energy-Efficient Investments” Olena Nikitina spoke at the conference “Basic tendencies of solar energy development”, which took place on June 18 -19, 2010 in Rostov-on-Don with the report on topic: “Development experience of alternative energy in Ukraine”. “Fund of Energy-Efficient Investments” is a member of «Sun stream»(«Сонячний потік») consortium, which organized this event. According to the sum Memorandum was adopted. Honorary President of “All-Ukrainian Association “Energy Efficient Investments Fund” Igor Cherkashyn carried out working meeting with Euro-Asian International Chamber of Commerce honorary president Monika Maria von Habsburg-Hohenberg. During this meeting cooperation prospects in the field of efficient use of energy resources and renewable energy were discussed. Plan of actions for the effort coordination was laid down for the purpose of the attraction of investments into economy of Ukraine. The High Contracting Parties negotiated joint carrying out of All Ukrainian fair of investment projects within the framework of the 3rd International Investment Summit. Honorary President of the Fund Igor Cherkashyn took part in the seminar which was organized by Swedish Energy Agency in common with National Agency of Ukraine on Ensuring of Efficient Use of Energy Resources (NAER) “Swedish integrated solutions for energy sector in Ukraine”, and also participated in round work table with the assistance of members of the Government, SEB, Swedbank, EIB, NEFCO, The World Bank, IFC, SKF, ABB, Atlas Copco, Ekobioprom. Leaders of the Fund Igor Cherkashyn and Olena Nikitina visited 11th International specialized exhibition “Energy. Electrical engineering. Automatics” in Donetsk and took place in 4th International theoretical and practical conference “Energy efficiency of big industrial region”. Igor Cherkashyn made a report “Influence analysis of government control on energy efficiency in Ukraine” in which he elucidated role of state bodies in the questions of development of renewable energy and control for the energy consumption level of enterprises and other organizations. Besides Mr. Cherkashyn payed heed to the question of Energy saving state standard which is a successor of energy consumption normalization system and made analysis of state budget – 2010 from the point of view of energy efficient program financing. After the report Igor Cherkashyn answered many questions of attenders. 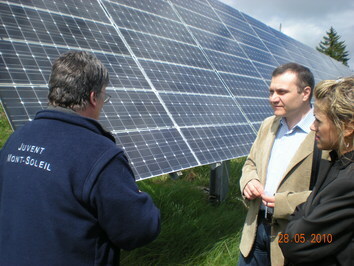 In May 2010 representatives of “All-Ukrainian Association “Energy Efficient Investments Fund” with the purpose of experience exchange in field of solar energy visited training center in Switzerland. May 14, 2010 the Association "Ukrainian Union “Energy Efficiency Investments Fund” has become a new member of the Euro-Asian International Chamber of Commerce.